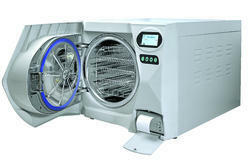 Manufacturer of a wide range of products which include desk type autoclave sterilizer. Control and printing: fully automatic plccontrol system provides on-line documentation through in-huilt printer (optiong1). Scada: provides the option to fink pc to the autoclave for remote control and monitoring. records in three formats (detailed report, summary, graphican be stored in the pc and reprinted as and when required.